GOLDEN AGE BACKPACKERS - Pause and Smell the roses not the Fumes! the center of Cottage Grove. Are you heading south on Interstate 5 and wishing an alternate to an overnight stay in a chain motel/hotel, having an evening dinner and rising to an early alarm to hit the pavement for another tedious day of driving? We had considered venturing off the beaten path making our drive more of an exploratory trip but our selections usually involved considerable detours to and from I-5. This time we did discover the perfect stopover location, Cottage Grove! Our deluxe room complete with my foot! Village Green is located approximately 40 kilometers (25 miles) south of Eugene, Oregon in the heritage town of Cottage Grove. After driving eight to nine hours it was the perfect stop-over spot for us to enjoy the countryside and relax before continuing to our final destination- Sacramento. Cottage Grove bills itself as a friendly recreational, family oriented small town. For us the town added interest to an otherwise predictable drive. Cottage Grove is small enough to be able to wander the local antique shops, view hand painted murals and examine intact collections of historic 20th century buildings. And, of course, dine at local restaurants to sample the regional cuisine. The first evening witnessed us dining at Stacy's Covered Bridge Restaurant marveling over their cedar plank salmon special. The town also boasts a 17 mile dedicated paved bike trail. Unfortunately due to the season's lateness, the resort's bikes were stored and the local bike shop had bikes previously booked. The trail sections we saw from the road looked impressive. Next time! The current bridge is at least the 4th on the site. Cottage Grove has the distinction of being the "Covered Bridge Capital of Oregon." 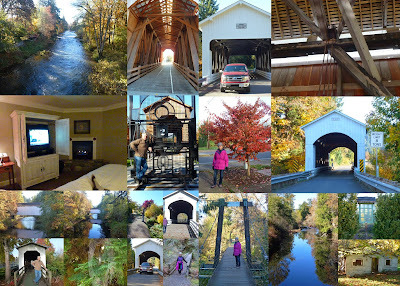 The seven restored covered bridges do verify the town's claim as this is the largest number in any town in Lane County! The bridges were built between 1900 and 1925, the regions heyday for construction and farming. From local sawmills, readily available timber was used and house-like structures were built over the bridges to prolong the bridges' life spans. The first morning of our stay we followed a detailed easy-to-follow map that was part of our resort package. The roads we drove were paved and the traffic was sparse with the fall colours and landscapes creating a magical atmosphere as we visited and photographed each bridge. with Mosby Creek gently flowing beneath. Lunch was at Torero's Mexican Restaurant and after a wander through the historical business section, we again consulted our tourist map and drove River Row Road to the Brice Creek Trailhead beginning at Cedar Creek Camp Site. After taking a wrong gravel side road and climbing for a few miles, we turned back and easily located the camp a few meters past the erroneous turnoff. Our plan was to hike to a set of falls. However, presented with a fork in the trail we elected to hike left while we should have gone right. We missed the falls but the hike was enjoyable and scenic, plus providing needed exercise. That evening in the Village Green Restaurant, we enjoyed our complementary dinner complete with a bottle of wine. I selected a trout dish special and Doreen chose the salmon plate. Both selections were delicious and cleverly presented. After our meal a short stroll was in order prior to retiring for the evening and preparing for tomorrow's road journey. Cottage Grove is favourably located to allow us to divide our 1500 kilometer drive into two days driving with an intrepid pause to explore a region. The historic town is situated close to the freeway making for an easy exit and return. Yet, only a short drive from I-5 and you encounter the town surrounded by rolling pastures, lakes and beautiful forests. We left Village Green refreshed and with an appreciation and better understanding of the county's environment and culture. On our next drive south we plan to pause at Cottage Grove to further explore the surrounding countryside and ride the bike trail! One of the resort's beautiful gardens. Our deluxe room sported a fireplace plus T.V., fridge and microwave. A set of patio doors led to a small private patio area. Excellent decor and king size bed. A spider enjoys the garden. The resort offers a variety of special packages. Our Dinner Package Special included a dinner with wine and two nights' accommodation in a deluxe room and breakfasts. At check-in we were presented with an information package about restaurants, local maps, entertainment and coupons for a wine tour as there are many successful wineries in the region. The resort features large gardens of flora, ideal for wandering through. We felt that the package special was an excellent value as the dinner for tipping purposes was valued at $62.00 US. The total package cost $139.00. Located in a small shopping mall. Good ambiance and the Mexican lunch was tasty plus pleasant prompt service. Reasonably priced. Wal-Mart: located next to Village Green Resort just off Row River Road. The supermarket is a good place to stock up on lunch provisions for the next day's travel. Travelzoo is a publishing company listing travel, entertainment and local deals. The company evaluates deals to judge their value. On the company's web site they publish a weekly top 20 selections that can be sent to your e-mail. We've taken advantage of offers and have been extremely pleased with the results. 3) Chambers Bridge - built in 1925 and restored in 2011 - employed by a timber company as a train bridge. 7) Currin Bridge - 1925 ( replaced an earlier bridge built in 1883) - Restored 1995.